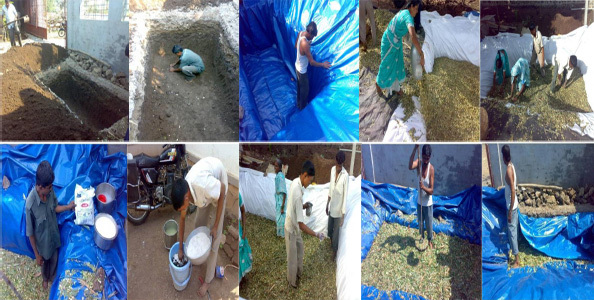 Silage preparation is one of the important methods for storage of green fodder for dairy animals & it is necessary to adopt this method by Indian dairy farmers on large scale in situations like drought or heavy rainfall or scarcity of fodder. Silage making means preservation of chaffed cereal green fodder in anaerobic condition by way of fermentation method. In anaerobic condition (no air inside pit/tank),with the help of micro organisms, sugar contained in green fodder is converted in to Lactic acid ,which help to preserve the green fodder for longer duration. Respiratory function of living cells present in green chaffed fodder utilises Oxygen in air tight condition & releases water & carbon dioxide in closed environment in pit/tank. Due to Carbon dioxide releases in pit/tank, air inside is expelled outside as well as organism which depends on oxygen (Like bacteria & Fungi) cannot withstand in CO2 atmosphere in Tank/Pit. These effects in to preservation of chaffed green fodder in silo pit/tank as silage for longer duration (6 months or max. a year if good care is taken). To prepare best quality silage, cereal green fodder like Green fodder maize, Fodder sorghum, Bajara, Hybrid Napier, Sugar cane tops, Oat, Marwel etc are required. Preference for cereal green fodder (monocotyledons) is due to it has more sugar content than protein, as sugar is utilised in fermentation process to make lactic acid by microorganisms. These cereal fodder crops have hard stem, which takes more time for drying in making hay of these crops, so it is better to use these kinds of crops for making silage than hay. Silage is storage system of green fodder which keeps all parts of fodder in appropriate condition for feeding than any other system of storage of fodder. Silage requires less space for storage as it is pressed in pit/tank than hay making. For daily cutting, transporting & chaffing of fodder in traditional way requires more labour &time but in case of silage, fodder cutting, transport, chaffing is done at one time only, so it is less labour & time consuming practice. Land under fodder cultivation is emptied, and immediately it is used for plantation of other crops. So farmers’ can take more crops in same land in a year against traditional way where land is reserved for fodder until all crops is harvested. Due to lactic acid in silage, it is easily digestible to animals, so energy required for digestion is used for other purposes like milk production.etc. Silage is tasty & flavoured, so it increases appetite of dairy animals. Due to treatment of additive for silage, farmers can supply energy, mineral & vitamins to dairy animals. There are two methods for silage making which are vastly used i.e. Pit method or tank method. These two methods are economically viable for dairy farmers. For planning of silage, following aspects needs to pay attention-How many dairy animals farmer’s have? How many days farmer’s have to feed animals with silage? Is sufficient green fodder is available with farmer to prepare required silage? On the above points, decide to plan for silage making, there is example for you- -One dairy farmer has four adult milching dairy animals. He has to plan for silage for four summer months (i.e. March to June), so go through following points- There are four milking dairy animals Farmers have to make silage for four months i.e. 120 days Maximum per day feeing of silage is 20 kg per animal so per day feeding for four animals as 80 kg. So for four months i.e. 120 days for four animals requirement of silage is 9600 kg.This means 9600kg of chaffed green fodder is require to make silage for four dairy animals for four months. In one cubic foot in pit or tank (1 cubic foot = 1 foot long × 1 foot wide × 1 foot high),contains 16 kg of chaffed green fodder. To decide dimension of pit/tank for 9600 kg chaffed green fodder ,you may divide it with 16 kg, so you may have to make 600 cubic feet of pit/tank as 20 foot long × 6 foot wide × 5 foot high. Depending upon local situation like ground water level, number of animals & duration of feeding silage to animals, decide shape & size of constructing pit/tank for silage making. For pit method, select location for making pit at higher level on ground so that rain waer may not percolate in to pit. In rectangular pit, corner edges should be making round so that while filling & pressing chaffed fodder, air will not remain inside in the corners of pit or tank. Wall of pit/tank should be air proof to avoid air too come inside in pit /tank through cracks or crevices .To avoid this situation, plaster wall of silo pit or tank with cement or moistened soil. If ground water level is nearer, then go for building tank for silage making than pit method. If plastering cement to the wall of pit/tank is uneconomical, then you may use HDPE plastic paper (200 micron) to cover pit/tank inside out position. Per ton of chaffed green fodder requires 1 kg Urea, 2 kg jaggary, 1 kg common salt, 1 kg mineral mixture & 1 litre of Whey. Prepare separate solution in 15 to 20 litres of water for Urea, Jaggary, Mineral mixture & common salt in separate pots/buckets & then spread it on layer of pressed chaffed green fodder while filling silo pit/tank. When fodder crop is in cob stage or Tussling stage, harvest it for preparation of silage. Very mature stage is not good for preparing silage as its sugar content is decreased as well as fibre percentage in increased; this kind of fodder is less suitable for silage making. Prior to filling silo pit / tank, clean& dry it. Cover with plastic film inside pit/tank in such way that it will cover all sides of pit/tank. For making silage, chaffing of fodder is essential component. With the help of chaff cutter machine, make pieces of 1.5c.m. to 2 c.m. length of green maize.sorghum,sugarcane tops,marwel,Fodder bajara etc for filling silo pit. Start to fill chaffed green fodder in pit or tank. After making 4” thick layer of chaffed green fodder, press it with wooden plank(Like Mortar) in such a way that air will not entangled in chaffed fodder. Then sprinkle it with prepared solution of Jaggary, Mineral mixture, Urea, Common salt & whey. Follow the same procedure until filling of pit/tank 1 to 1.5 feet above the ground level(In pit).Then covet it from plastic film from all side carefully. Covet it with Trash, Wheat straw, Soil & dry hay to protect it from entering rain water in to it. If possible to temporary arrangement of shed above the silo pit/tank. It will require 45 to 60 days to make good quality of silage. After 8-10 weeks, silage is ready as feed for animals. Open pit/tank initially from one side of for use. If it is not in use, then cover it carefully with plastic film so that air will not go inside in silage. Initially fed animals with 5-6 kg silage by adding it with chaffed green fodder to develop taste to animals. Once animal likes sweet-sour taste of silage; it will eat it with good liking. Mould : If silage while filling pit/tank, not well pressed; there will be growth of mould. Odour : Good quality silage has sweet & sour taste. Colour : Good quality silage has faint green or brownish colour. Rotten silage has black colour. pH : Good quality silage has pH of 3.5 to 4.2.